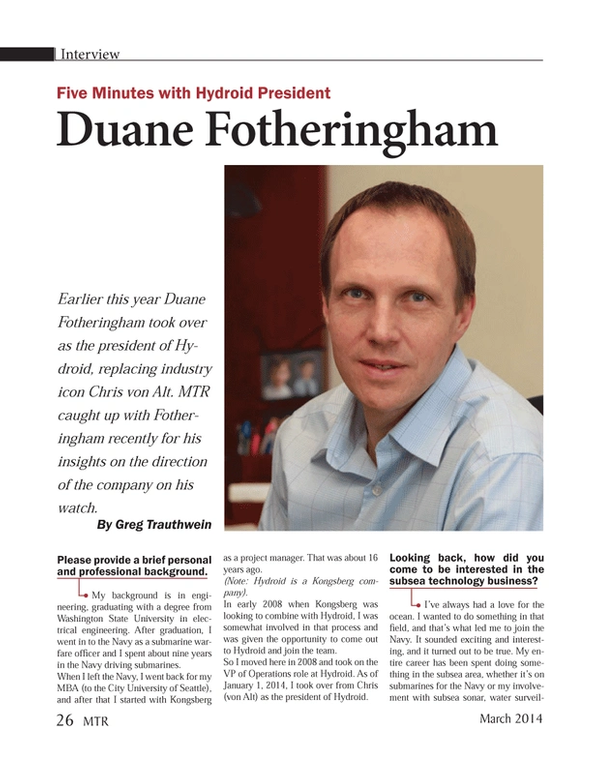 Earlier this year Duane Fotheringham took over as the president of Hydroid, replacing industry icon Chris von Alt. MTR caught up with Fotheringham recently for his insights on the direction of the company on his watch. Please provide a brief personal and professional background. My background is in engineering, graduating with a degree from Washington State University in electrical engineering. After graduation, I went in to the Navy as a submarine warfare officer and I spent about nine years in the Navy driving submarines. When I left the Navy, I went back for my MBA (to the City University of Seattle), and after that I started with Kongsberg as a project manager. That was about 16 years ago. (Note: Hydroid is a Kongsberg company). In early 2008 when Kongsberg was looking to combine with Hydroid, I was somewhat involved in that process and was given the opportunity to come out to Hydroid and join the team. So I moved here in 2008 and took on the VP of Operations role at Hydroid. As of January 1, 2014, I took over from Chris (von Alt) as the president of Hydroid. Looking back, how did you come to be interested in the subsea technology business? I’ve always had a love for the ocean. I wanted to do something in that field, and that’s what led me to join the Navy. It sounded exciting and interesting, and it turned out to be true. My entire career has been spent doing something in the subsea area, whether it’s on submarines for the Navy or my involvement with subsea sonar, water surveillance and diver detection at Kongsberg, to my five years to date with Hydroid. Coming into this position, what are your immediate & short term goals? The biggest thing that I’d like to do is continue the growth and success that we have had up to this point. Hydroid had been successful with passionate, innovative people delivering an excellent product to our customers. Over the last three years we’ve had 30% or better overall growth in the company, and that’s revenue and in people. At the end of 2012 we were 84 people; we added 36 over the course of 2013 so we’re up to 120. And we’re planning to bring on 30 more over the course of this year. As we (Hydroid) grow up, we want to maintain that small company feel, that agility, innovation and passion and the connection to the product, the commitment to please the customer and build the best possible product that we can. But still, to grow and put all of the things in place that are necessary as a company gets larger, the infrastructure to support an increasing number of employees and a growing customer base. You have security requirements for dealing with the product we create. So it’s putting all of those things in place that adds value to the company and doesn’t detract from or change the things that got us to where we are at. What is the greatest strength of the brand? Part of it is the people that work here. You can’t create that kind of passion unless people really feel it, believe it and really love what they are doing. The product is known for reliability, and hopefully we are known for being people that you can count on. As we all know working in the subsea industry, when you are putting things in the water things don’t always go as planned. But when they don’t go as planned, you want to have a company, people that you can count on to handle the situation and make it work and be successful. Kongsberg is also a strength of our brand. We have a complimentary vehicle line with the vehicles at Kongsberg (Hugin), the vehicles of Hydroid, the REMUS line, and our sister company out in Seattle is now building the Sea Glider. We also have sensors and integration that can bring together what we call the “Full Picture” solution. Across the company we can offer all of those pieces, and bring all of that to bear to solve a problem. What do you consider the greatest weakness of the brand, and why? We’re at an incredible point in our history, particularly in terms of growth. The challenge is to maintain all of the things that made you good when you were smaller, and continue to do them when you are larger. In short, describe the maturity level of the AUV market in general, as you see it. Specific to the product, how is your company investing today? We’ve talked about our investment in people, in talent, and that’s something that we are always looking to do. In addition, we are building a new facility which is located just down the street from our present location. We are building a new 40,000 sq. ft. engineering and production facility, designed and built from the ground up to be a state-of-the-art AUV, marine robotics, engineering and production facility. That’s a big investment in the company, in the technology, the future of the business and the future of the market. (Move in is planned for August 2014). When you look at the markets (both by geography and market niche) that you serve, what do you see as the brightest prospects in the year to come? We see growth in all markets. Traditionally we’ve done very well in the defense market. A large part of Hydroid’s success has been in the defense market, both foreign and domestic. Our strongest presence is in the U.S. Navy. The academic market is strong, and we have strong ties and roots in the market, as you know we came out of Woods Hole. That gives us a lot of synergy with that community. Across the board it is growing, both foreign and domestic. I think we see a lot of opportunity in that market. Of course our parent company with the HUGIN vehicle has been very successful in that market. We have a joint development of the MUNIN, a combination of the REMUS 600, which we are sharing that technology with our sister-company in Horten, and they are taking it and making it in the family of the HUGIN with the same operating systems, interfaces and controls but in the smaller lower-logistics platform of the REMUS 600. It’s a great blending of those two technologies to come to the market with a product aimed at the oil and gas industry. If you had to pinpoint a single (non-vehicle specific) technology that will have the greatest positive impact on AUV efficiency and performance in the coming year(s), what would that technology be and why? I think vehicles are becoming smarter. There is more intelligence and autonomy in the vehicles. They’re able to go out and do more things, more applications. If you look outside of that, one of the limitations of putting something in the water is how much energy you can put into it. The technology for energy storage and batteries, and having greater energy density and safer technologies is something that will drive efficiency and performance in the future. What do you consider the key to attracting and retaining the people that you want? Giving them interesting work in an environment where their ideas can be heard and put to use. Giving them the freedom and autonomy to operate, to create and bring solutions to bear.